Willis Tower is the tallest building in the U.S., but globally it is the fifth highest independent. This giant skyscraper with broken- up architecture is the pride of the city of Chicago. 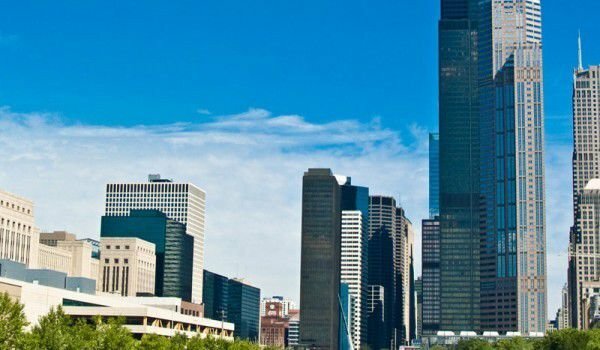 Until 2009, Willis Tower was known as the Sears Tower, but even after renaming it on July 16, 2009, when the building was officially opened with a new name of Willis Tower, many residents still call the Chicago skyscraper with its old name. Sears comes from the company name "Sears, Roebuck & Co.", which was initially ruling the building for 30 years. Willis Group Holdings is the name of the new largest tenant, who are a British company involved in the insurance and brokerage business. Enforcement of the renaming was not welcomed by the Chicago community, petitions and letters to the mayor were written, who strongly stood against changing the name of the famous Chicago landmark. When it was built in 1973, the current building Willis Tower was the tallest in the world. They say that in clear weather at the top of its towers are visible the neighboring states. With a height of 443 meters and 110 floors, the completed skyscraper was beyond the towers of World Trade Center in New York, which were completed a little earlier that year and demolished in the unfortunate attack on 11 September. The start of construction of the Willis Tower was in August 1970 and was officially completed on May 4, 1973. The giant continued to be the tallest building in the world until 2003 when the first place went to Taipei 101 in Taiwan, ahead of Willis Tower, by only 6 meters. The odd skyscraper architecture makes it a favorite with residents of Chicago. The idea of creating the building comes from 9 cigarettes, put in a square and then moved around each other, which builds up the broken architecture. Willis Tower consists of 9 square tubes and columns, forming a large square at the base. The building stands on a concrete base with a gravel cover. The tubes remain together until the 66th floor, five of them - to the 90th floor and only two make up the remaining 20 floors. On the roof there are two giant television antennas, and a platform beneath them. Allegedly, in clear weather, the vast Willis Tower can be seen from the neighboring States of America. The building was designed by the architectural firm "Skidmore, Owings and Merrill" - the same that creates plans for the construction of another skyscraper in Chicago - "John Hancock Tower", located in the North Side neighborhood. Design and construction continued for about 3 years and works were engaged for about 1, 600 people. Cellular heaven Willis Tower has an observatory, built on the 103rd floor, which annually attracts about 1.5 million visitors from around the world. Willis Tower extends over an area of 323, 000 square meters, equivalent to 57 football fields. The tower has 104 high- speed elevators to the building, divided into three parts. 16, 000 tinted windows line the structure, which is lined in black aluminum. To maintain a good appearance, Willis Tower is cleaned 8 times a year by six automatic windows washers.